We Include 2 Halogen Lights! Shop and compare! We deliver Great Prices and Great Service! Included graphics consist of approximately 15 square feet of CMYK printing. Rugged carrying case that holds your graphics, frame and lights. This makes portability a snap! And the Frame carry's life time warranty! Set up time... 20 minutes if this is your first time. 15 Minutes if you've used this type of pop up display before. If it takes any longer, call me from your trade show. I'll be happy to walk you through it. Send me some pictures from your trade show exhibit. I'd like to put them up on our site and give you some free advertising! * We reserve the right to substitute trade show displays to accommodate your purchase. Trade show display substitutions shall be of equal or greater value than what is seen on this page. Why? Lets say you order an economy model trade show display. 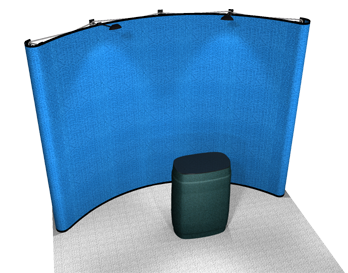 Your trade show display is needed within three days... We just sold our last economy model display and won't be manufacturing another economy trade show display until next week. However, we have a trade show display a notch above the economy model display. We would rather you get more than you paid for, be a happy customer and come back for reorders.